Painting my yard again. This one makes me think of Alex Colville’s paintings (see his work here)—not in the style of painting so much as in the mood of the painting. Maybe it’s the advancing dark clouds or the slightly odd teal roof-top beside the terra-cotta coloured bushes that gives it that slightly unsettling mood, I’m not sure. I like the painting. I actually started it yesterday and it was so ugly I was ready to burn it today. My husband told me that it wasn’t that bad and that the sky was actually very similar today so I should try to do a bit more work on it. And bless him, he was right! I haven’t done a backyard painting in a couple of months, but I have been photographing the yard at different times of day. I’m just not as excited about a photo as I am about the real thing. I guess it’s like when you see an amazing sky and you just have to take a picture, but the photo is never as good as it really looked when you were there. When I see an amazing sky I want to paint it, right there and then, the same way one would take a photo. I want to capture what’s so hard to capture in a photo. Though I think I might try some backyard paintings from the photos as a comparison—maybe one summer series from life and one summer series from photos. It would be neat to be able to paint those beautiful fleeting moments that I’m not quick enough to paint. 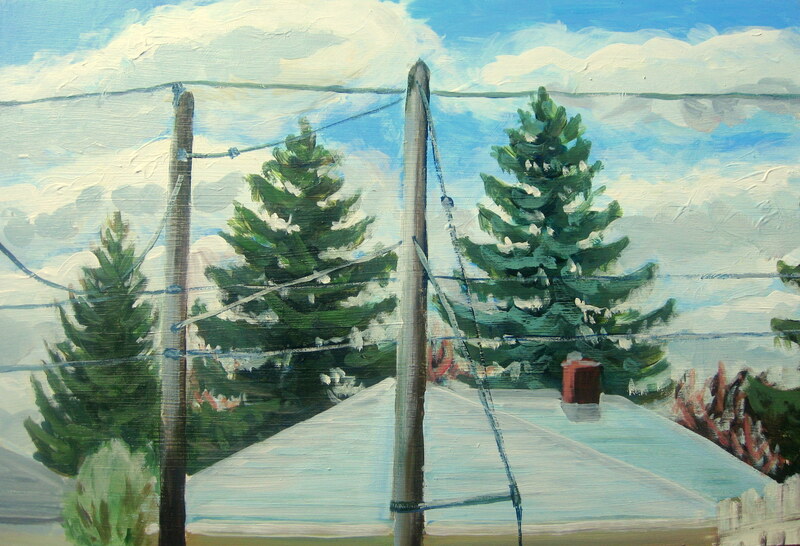 I wonder if I will tire of doing paintings of the backyard? I’m a little surprised that I am still fascinated by all the different nuances I see, but at the same time I’m not surprised. It’s not the same as painting the shed…with generic white porch paint…every year…like I had to do on Friday and I really should have been finishing up today…I could get tired of that real fast. ← My daughter, my muse. You’ve hit the nail on the nogen! To capture fleeting moments from life in a photograph that can’t always be captured in life. That’s what painting from photos is all about. I would love to see both as well, as a test. I like this painting too, a lot more detail in it. Well done!